Noted iconoclast and Earthbound creator Shigesato Itoi's company Hobonichi has teamed up with Nintendo to offer three video-game themed haramaki in Hobonichi's summer catalogue: one featuring everyone's favourite plumber, with the other two designs starring Earthbound's Mr. Saturn either alone or stacked. In case the beer, pretzels and steady march to middle age and beyond haven't left you with adequate midsection insulation or you just think it would make a darling gift, English instructions on how to order are here and actual ordering takes place on Hobonichi's online shop. Hey, at least it's something Mother related available to the west. Let's bellyache in the comments! Go to the actual Japanese store sight and check out the stitching on the Mario one... amazing. Wait...it's a piece of Mother merchandise... available to the West!? I must be dreaming! Edit: Read it wrong. ****. May actually pick this up then. Maybe it's a sign or a hint or a message or a tease!!! Ahhhh Mother 3!? I'm just not sure how I'd explain it, though! Person: What's that you're wearing? Me: It's a Mr. Saturn haramaki. Why not just wear a vest..? I'll make sure that I put on my priority list, with buying Mother 3 right before it. I like the quirky nintendo products japan makes. 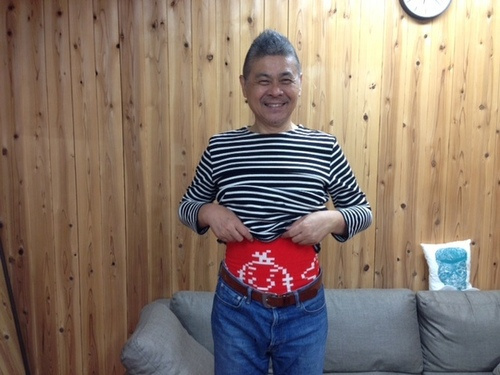 They need to make them in NOA too, even items like this belly warmer would sell simply because its nintendo themed. Weird stuff. But then again, Japan.